Please contact Atomic directly via Live Support, Email us at customerservice@buyatomic.com or call us at 608.781.2339. SELECT A PRODUCT STYLE from image(s) below - Styles shown are all that is currently available per the Manufacture/Dealer/Shop. LOGOS - Type the name of the Logo in the designated box available for this design available per the Manufacture/Dealer/Shop. Branded Design Apparel cannot be altered to Add additional Logo Placements, change Logo Placement positions and/or add designations. These perimeters were set by Manufacture/Dealer/Shop. Logos will not appear on the Image.Logos are added by an Atomic Design Specialist during the proofing process. Atomic has most Logos on file. If Atomic does not have a logo on file design will contact you to obtain your logo to be provided in a Vector, Adobe Illustrator, or PDF format. Logos are not mandatory. Branded Design Products can be ordered without logos. LOGO POSITIONS - View Product Image Front, Back, Left and Right Sleeve to see available logo positions. SELECT QUANTITY - To order multiples, build each product individually and Add Product. To order multiples the same choose QTY and Add Product. PAYMENT – Add Product(s) to Cart and proceed through checkout. ORDER CONFIRMATION - An Order Confirmation will be sent to your email provided during the checkout process once an order has been placed. 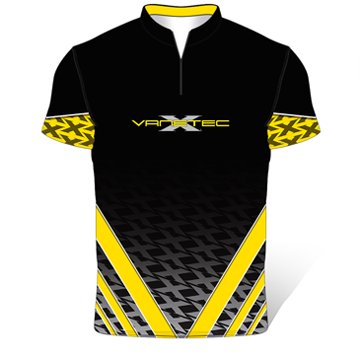 JERSEY PROOF - Once your order has been placed design will email the proof render for review and/or approval to enter the production schedule to begin manufacturing. DELIVERY TIMELINE - Once the approval is received the order is entered into the Production Cycle to start the manufacturing process. Order approvals received on Fridays will be sent the following week. Manufacturing and Delivery is 30-35 Business days (7-8 weeks) Do to the custom nature of our products we do not offer Rush Production or Shipping.